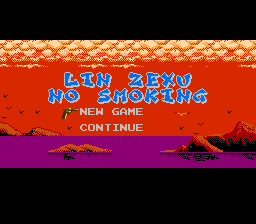 This is the fully translated English version of of the Chinese game Lin Zexu - No Smoking for the NES. 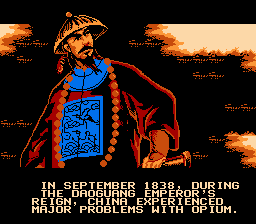 In September 1838, during the Daoguang Emperor's reign, China experienced major problems with opium. The Emperor declared a ban on opium, and appointed Lin Zexu as the Imperial Commisioner. His goal is to uphold the ban on opium, and stop all of the smugglers responsible. 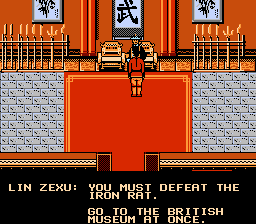 A young martial arts student, Longyin Yu, pledges to help Lin Zexu uphold the ban, and becomes Lin Zexu's apprentice. 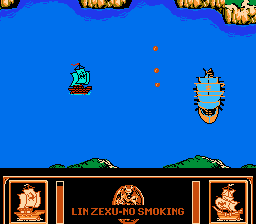 You assume the role of Longyin Yu, as he performs various tasks, and goes on different missions for Lin Zexu. Can Lin Zexu uphold the on opium with the help of Longyin Yu, or will the British Empire continue to smuggle opium into the country?